What happens when you take The Mist and combine it with Jaws? Well, you’d probably end up with a movie that’s a lot more interesting than 2012’s Bait. Bait opens in an Australian supermarket and it’s nice to see that supermarkets in other countries are just as bad as supermarkets in America. Two teenagers make out in the underground parking garage. A former lifeguard stocks the shelves. (The lifeguard, incidentally, was previously traumatized when he saw a friend of his eaten by a shark.) The sister of that friend who got eaten by a shark shops with her new boyfriend. The store manager gives people orders. Two masked men try to rob the place, which leads to shoot out with the police. It’s just a typical day! Until, of course, the tsunami hits! Now, on the one hand, the tsunami hit at the perfect time because it kept the masked men from shooting anyone else. On the other hand, the tsunami hit at absolutely the worst time because apparently, sharks can survive anything. Not only is the supermarket flooded but now, there is now a giant shark swimming through the aisles! Our survivors all scramble to the top of the aisles, where they find themselves stranded. Not only is the water shark-infested but there is also the risk of being electrocuted by broken wires! The survivors are going to have to set aside their differences and work together if they’re going to escape the deluge of sharks and bad feelings! Of course, if you know anything about these type of movies, you know that a group of people can never set aside their differences and work together until at least a handful of them have been eaten. At one point, our survivors attempt to escape by building a makeshift shark cage out of grocery carts. That actually might not a bad idea but it just looks so silly! Anyway, the main problem with Bait is that the film, much like the characters, has no place to go. The idea of a shark invading a supermarket has potential but once everyone’s stranded on top of their aisles, the action slows down to a crawl and we spend way too much time listening to thinly drawn characters shout insults at each other. The characters are trapped but, unfortunately, so is the audience. I was actually far more interested in the couple that was stuck in the flooded parking garage. Those scenes, of the two of them trying to figure out how to escape from their car, had a claustrophobic intensity that the scenes in the supermarket lacked. Lincoln Lewis and Cariba Heine were fun to watch as they bickered with each other and debated who was more to blame for their predicament. Perhaps because they were separated from all of the noisy drama in supermarket, Lewis and Heine actually seemed to be having fun with their roles. 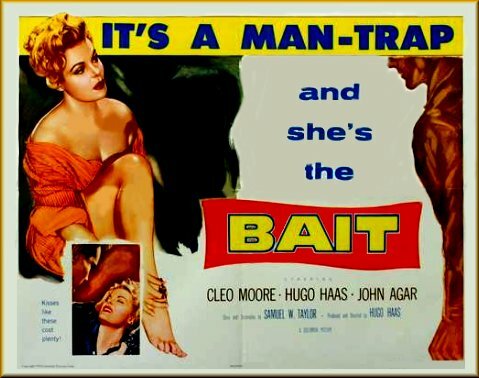 Anyway, Bait is one of those films that tends to show up fairly regularly on the SyFy network. It’s not a particularly good movie but it is a reminder that the cinematic legacy of Jaws will outlast us all. To be honest, if the sharks ever get together and form some sort of anti-defamation league, the film industry is screwed.